I am delighted with the new poetry collection from this Nova Scotia poet who stole so many hearts when she launched her first book, The True Names of Birds, in 1998. Firmly rooted in Nova Scotia’s natural environment and culture, the poems in Outskirts feel quite at home in my urban prairie setting. As I feel in Gus’s Pub. Intimacy, inventiveness, complexity, and clarity are the words that come to mind when I consider these satisfying, metaphor-driven poems, where fog is “A low prowl of Atlantic rooting / through the city like a bear. . . a crowded harem // vying to undress all lights. . . // A travelling salesman for thirst” (53), where fatigue is seen in terms of snow feasting on the body of a tired woman, and darkness is “the last animal,” to which “We hold out moonflowers and tender welcomes” but whom we cannot call by name. (103) Fog and darkness are important recurring motifs in the collection. 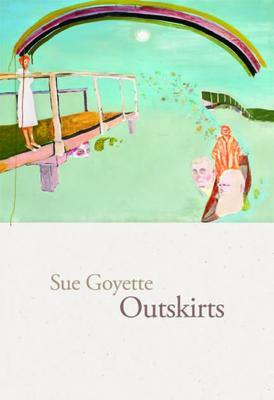 Goyette deliberately, often playfully, juggles concrete detail and sensation, concept and emotion as she interlaces family life with natural environment, loss of loved ones with loss of the art of conversation, loss of water and forest with loss of old songs and stories. The form she chose, a mixture of prose poems and verse poems written in long lines, encourages one to read slowly, and the effort is rewarded as the multi-layered images yield their secrets. The long lines also suit the mythical quality of many of the poems. On the Dalhousie University website, Goyette is quoted as urging her students to “Let [a poem] come out of the ground and take its own shape.” The poet has followed her own advice. The book is divided into two parts: “my darkness, my cherry tree” and “the last animal.” In the first part, the poems are meditations on the different stages of life, the inevitable passage of time and its victims. The opening poem, “Persist,” echoes Szymborska’s vision of life as an unrehearsed play for which we must write lines on the go. The blood-chilling depiction of the split moment when a child runs out in front of a moving car sets the stage and the tone for the entire collection. Young motherhood, with its fierceness and its fatigue, is soon followed by empty bedrooms. In the poignant “We Lean In, Closer” friends prepare to listen to a mother’s tale of her daughter’s travels. Illness and death of father, material losses – of income, to theft – attrition of general well-being, make mournful subjects, yet unusual juxtaposition of detail, flights of surrealism, and dry humour – “The fly that hovers above the old cat is too early. The cat / is just sleeping.” (39) – keep eyes riveted to the page. And did I mention one of my favourite poems, “U-Pick, a Triptych,” a sensuous, poignant depiction of a raspberry farm? In the multi-section poems in the second part of the book, Goyette uses language of environmental reports to draw the reader’s attention to the erosion of happiness, marital harmony, imagination, silence, “virtual extinction of flirting” (85). Our poet is a Cassandra with a funny bone, her dark warnings served on exquisite china and balanced with some hope. Goyette’s first collection, The True Names of Birds, was nominated for the Governor General’s, Pat Lowther and Gerald Lampert Awards. Undone, her second collection, was nominated for the Atlantic Poetry Prize, and Dartmouth Book Award. Her novel Lures was nominated for the Thomas Head Raddall Atlantic Fiction prize. She has earned a $5,000 Established Artist Recognition award in Halifax, received the Earle Birney Poetry Prize and the CBC Literary Award. I expect Outskirts, Goyette’s third poetry collection, to do as well or better. Buy it, for yourself and for anyone else who likes to be transported by words. Anna Mioduchowska’s poems, translations, stories, essays and book reviews have appeared in anthologies, journals, newspapers, on buses, and have aired on the radio. In-Between Season, a poetry collection, was published by Rowan Books. Eyeing the Magpie, a collection of poetry and art, was published in collaboration with four fellow poets. London, ON: Brick Books, 2011, ISBN 978-1-926829-68-5, 112 pp., $19.00 paper.